The complete absence of a spam filter at Kauffman Tire, a wholesale and retail distributer of tires, was inhibiting employee productivity. Associates were sifting through numerous spam emails every day, taking time away from their primary responsibility of working with customers. Their biggest concern was reducing the amount of spam in their associates' inboxes, and they wanted a solution which was simple to implement and easy to use on the backend. 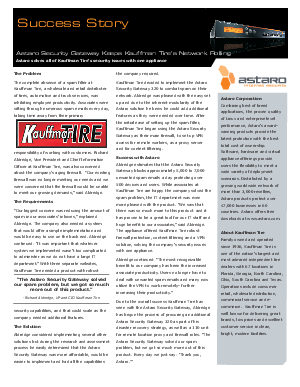 Get this case study to find out how the Astaro Security Gateway solved this problem and allowed Kauffman Tire employees to have more time to work with their customers.